When getting started with using Pinterest for business, beginners will often be told the same basic advice: get a business account. 🙄 Well, yes, you need that… but you need so much more than just that! Today, I share with you the 4 things you NEED to know to stop wasting your time on Pinterest and start getting results FAST. Telling you to get a business account is just another example of "gurus" focusing on small tactical stuff and wasting your time. It's not what's the most important for your success. Of course, you need to do that... but it's NOT what will move the needle. So whether you're a beginner, or are struggling with using Pinterest for marketing your business, you'll love this video where I share with you the 4 most important things you need to focus on. This post may contain affiliate links. It comes at no additional cost to you if you choose to make a purchase and helps me continue providing you with free content. I only recommend things I love and would tell my best friend to use. For more details, please read my disclosure. How do you Market on Pinterest in 2019? If you’ve started researching using Pinterest for your business and you're just getting started with it, most likely than not, you're feeling overwhelmed by now. And to be honest with you, that's how I felt as well when I started with Pinterest years ago. But here's the thing though, it's not your fault. It's because there is so much outdated and contradictory information out there, that it can be quite difficult to figure out what works and what doesn't on Pinterest. So today, I will be giving you the 4 most important things for you to focus on when you're getting started on Pinterest. So get a notepad and write these down! So the first thing I want you to focus on is your content, on creating fresh content. Weekly is best. If you can't do weekly, you can do less but weekly is best. Pinterest will reward content creators that are consistent and that are constantly producing fresh content. Now when you think about the type of content you create, think about what users are using the platform for. So Pinterest users are using it as a search and discovery tool. They're looking for ideas and inspiration. They're at a stage in time where they're not exactly sure what they want, they're just looking for ideas. So it's perfect for small business owners, because Pinterest users are at a point in time in their journey where they haven't made their decision yet as to what they will be buying. They're really open to new brands. They're really just in the discovering phase. And it's perfect for us to present our content and get in front of new people. Pinterest is a beautiful platform for that. Now the second thing that I want you to focus on when thinking about your strategic marketing for Pinterest, is to think about your images. So when you think about your graphics on Pinterest, the format is different. On Facebook they are horizontal, on Instagram square. While on Pinterest, they are vertical. The quality and the attention-grabbing factor is really important. So make sure that you've got headlines that really draw the attention. Colors should be bright and the imagery beautiful. The more beautiful your imagery is and the more "pop" that it's got, the better typically your pins will perform! Your graphics are really, really key. It helps to work with either a graphic designer or to use templates, and to really get to know more about how to use Pinterest graphics. Now I do have a post on my site all about how to design Pinterest graphics for clicks on Pinterest, so feel free to go and consult that for more tips. Now the third thing that I want you to focus on in terms of your strategic marketing approach to Pinterest is your consistency. Consistency is paramount on Pinterest. Pinterest rewards content creators that are consistent in terms of creating content, but also in terms of sharing that content on Pinterest. So day in, day out, you need to be sharing about 10 to 30 pins a day, depending on your profile, and so it can become quite overwhelming if you do that manually. I don't do that manually. I have better things to do with my time! And so what I do is that I use a scheduler. I use an automation tool that is approved by Pinterest, and it's called Tailwind. Try Tailwind for free by clicking here (this is an affiliate link - I only recommend tools I personally use and love). Learn more about using Tailwind here - it’s a detailed blog post, so go check it out. Now the fourth and last but not least, most important thing for you to focus on when considering your Pinterest marketing approach is to create a very clear path for turning browsers into buyers. what is that journey for getting on your email list? what is the experience for actually getting into your paid products and services? So I really want you to be very clear in terms of what's the journey. So I want you to envision what happens once the pinner lands on your site. What happens? What do they see? What's the experience? What's your email strategy? That is a very important aspect. A lot of people will only focus on Pinterest and driving the traffic, but it's so important to really think this entire journey through. 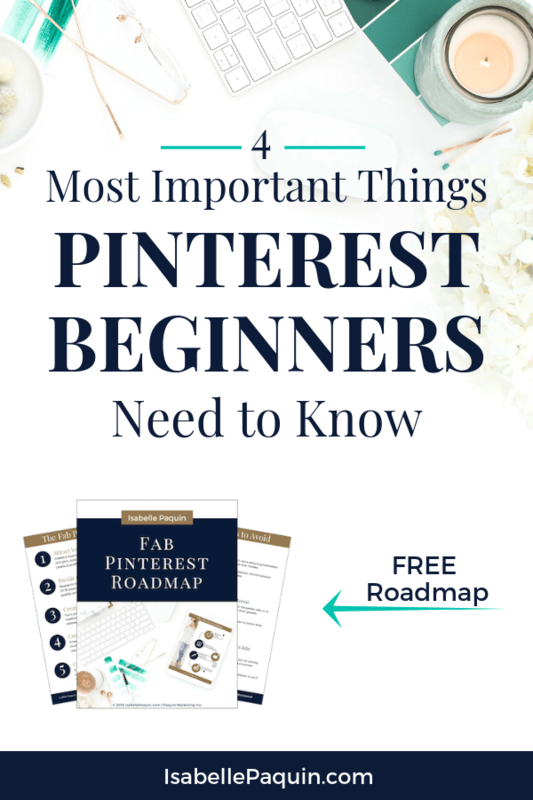 To help you get started with your own smart Pinterest marketing strategies for growing your business, I have created for you a FREE Pinterest roadmap, that gives you five easy steps to get started using Pinterest for your business. Want to connect with other coaches, course creators and service providers - just like you - that are ready to use Pinterest to grow their businesses?